Local background check from the Atlanta cops. Fingerprints and national check from the FBI. 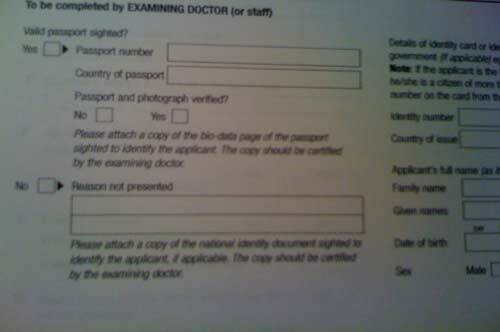 Physical check and chest X-ray from a doctor specified on Australia’s list of docs. Copy of my passport with a signature on the back asserting that it’s really me. The signature has to be from someone in a profession acceptable to the Australian government. This includes a pharmacist, so that’s who did it. A list of every single job I’ve held since college. A list of every country I’ve visited in the last ten years. A list of every place I’ve lived in the last ten years. Evidence that I won’t need Australian welfare. Evidence that my relationship with my wife is real and lasting. I’m supposed to provide evidence in several categories, including “social,” “financial,” and others. A statement of my relationship, describing how we met, how we “support each other,” and what our future appears to be. A certified copy of my birth certificate. Of course, this is aside from thinking about movers and real estate agents and passports for the kids, etc. I’m hoping that readers will be forgiving and pretend that this is an actual post, rather than just a list of crap. I mean, I think it’s interesting. Sort of…. It’s interesting, and I laughed, so you get points for that. Pharmacists are entrusted with a lot of responsibility, so that sort of made sense, but still it seems a bit silly. What about train engineers? Can you get on a train, ask to see the engineer, and get him to sign the back of your passport to say it’s really you? Well maybe, but will the government of Australia accept it; that’s the real question. I like to think that the government of Australia is somewhat more sophisticated than as presented in The Simpsons, but then again I like to think a lot of things, including the likelihood of the Folk Under Hill, the possibility of a form of alternate energy that isn’t a scam, and the chance that I may win the big lottery. I write this from a gorgeous resort in Hawaii, after a day of sightseeing and ziplining. When done and home, I intend to post pictures of this. For now, only a few select (and highly trusted) individuals know I’m not at home, guarding my possessions zealously with firearms and attack-terriers. Aloha. Aloha to you! I look forward to seeing the pictures. And a whole list of others. But it can’t be family.